I am sorry that I have not posted in a while, but sometimes things get in the way. It occurred to me during my last post that there are entire nations which I have not yet addressed, and I thought I should remedy this. I noticed in particular that I have not yet written anything about Scandinavia. I suppose I should mention that there is somewhat of a controversy as to what 'Scandinavia' includes, the most restrictive definition would include only Sweden and Norway; most people would also include Denmark, even though it is not located on the Scandinavian Peninsula, on historical, cultural and linguistic grounds. Likewise, the Faroe Islands and Iceland are often included for the same reasons. On the other hand, some people would include Sabme [Lappland] and Finland because of geographic proximity and some similarity of culture, even though they are very different in origin and language. But the Finns are very closely related to the Veps, Karelians, Ingrians, Izhorians, Estonians, and other peoples to the south and east, which arguably are located on the same peninsula, so where do you draw the line? I will take Scandinavian to refer to those people who speak a north Germanic language. Scandinavia is very rich in folk costumes, although for the most part they fall into a definite 'type', this one is an exception. 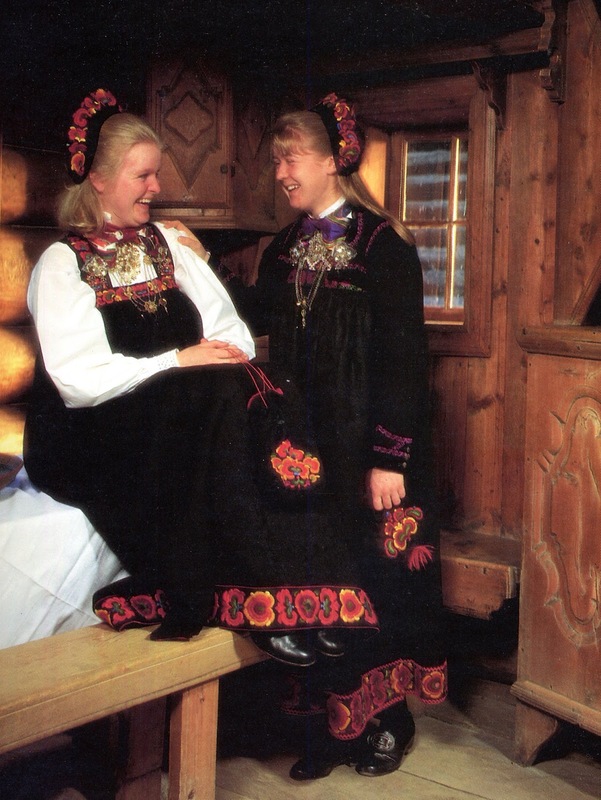 Norway has some very beautiful folk costumes, and they are very proud of them. 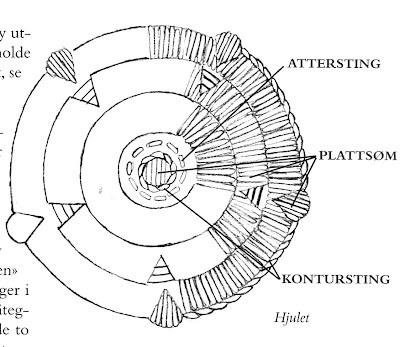 I will elaborate somewhat on the costume of the upper Hallingdal, especially the region of Gol. 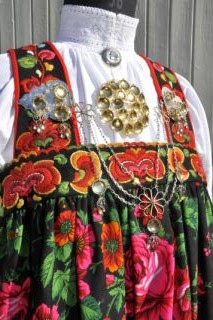 In Norway, traditional regional costumes which are officially recognized by the appropriate government agency are referred to by the term 'Bunad'. 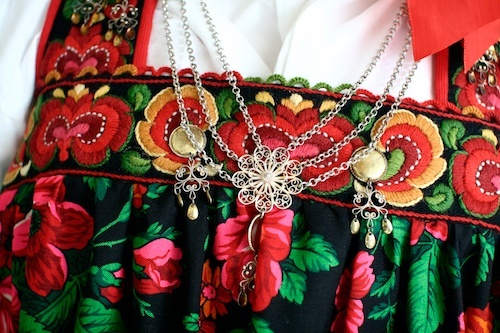 If a local form of dress is not so recognized, or if it belongs to another ethnic group, the term 'Drakt' is used. 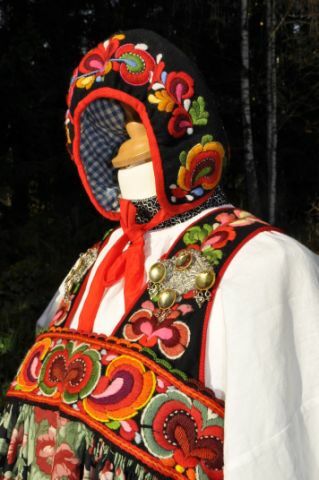 Two examples of such are the Saami [ Lapp ] costumes, and a costume which has been designed for the city of Oslo, called Samisk Drakt and Oslodrakt, respectively. The Halling valley, or the Hallingdal, [ dal means valley, so to say Hallingdal Valley is redundant], is found in the northern part of the province of Buskerud, which is shown in red in the south center of this map, although unfortunately it, like its neighboring province of Oppland to the north which is shown in green, is not labelled. 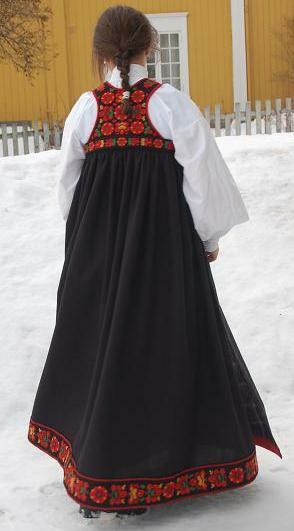 I will be focusing on the 'Festbunad', the festive dress of the area around Gol, Hemsedal, Hol, and Ål. These areas, along with Nes and Flå constitute the traditional region of Hallingdal. 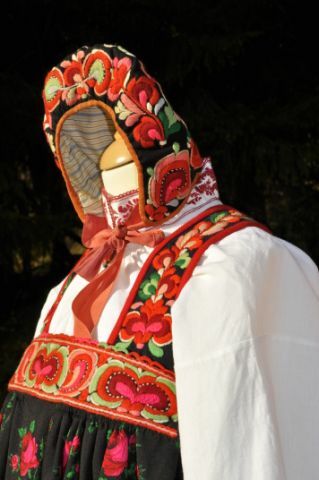 Here is a very extensive webpage of the costumes and embroidery of this region, if you wish to peruse it. 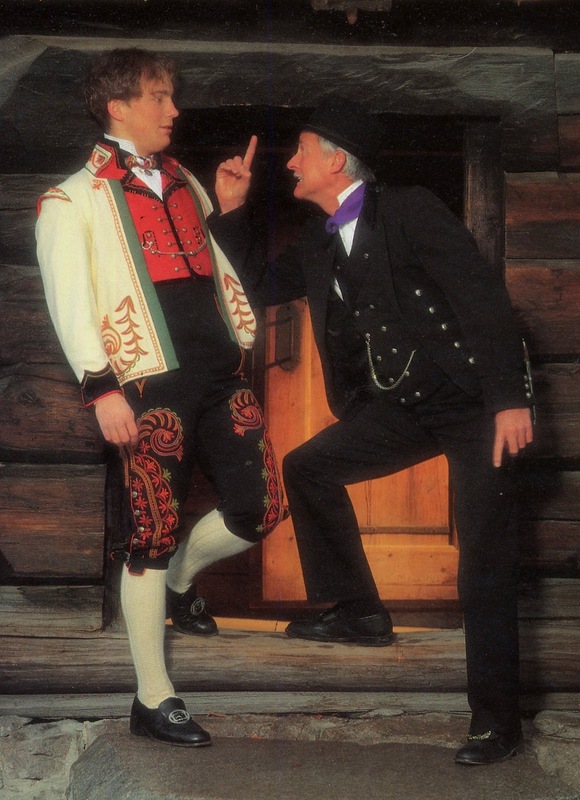 It is, of course, completely in Norwegian, and also covers costume types which I will not address in this posting. The base garment is the shirt, which was originally a chemise, and later became separated into two garments. There is of course, one or more petticoats worn as well. The Shirt is of the standard Norwegian cut, with stand up collars, collar pins and cufflinks. 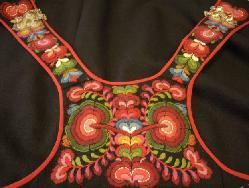 Most commonly the collar and cuffs have white counted-thread embroidery. The shirt is made of white linen. In order to be completely correct, over the shirt and petticoats, but under the festbunad, the everyday garment should be worn. 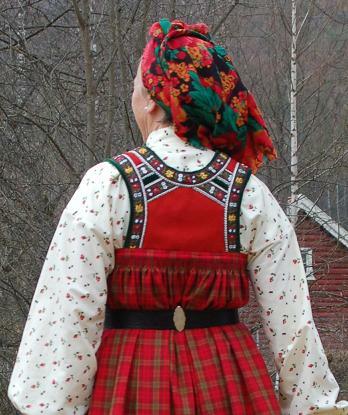 This is known as heljestakk, and is a simpler version of the outer garment, made either in plain black or plaid. This has a woven band around the hem, straps over the shoulders, and is worn belted. When worn as the outer garment for everyday dress, the shirt is often of cotton calico. 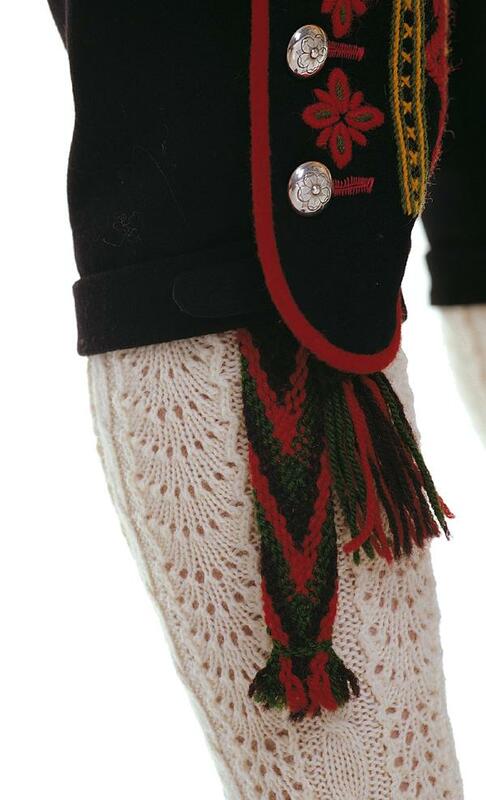 Since this does not show when worn under the festbunad, it is usually omitted today. 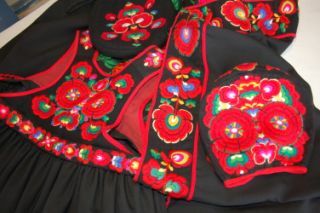 The outer garment is black wool, with dense embroidery on the straps, breastband, hem, and back piece. 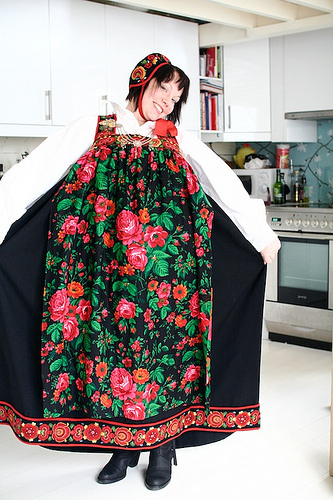 A rose printed apron is worn in Gol and Hemsedal. 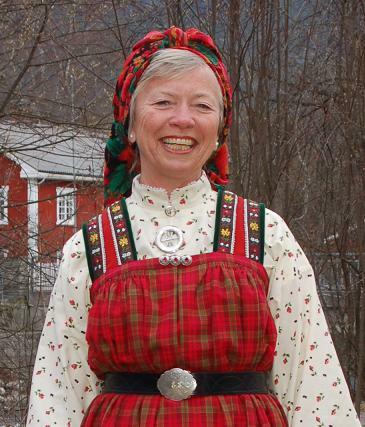 In lower Hallingdal; Nes and Flå, the apron is black with white lines in a checkerboard pattern. 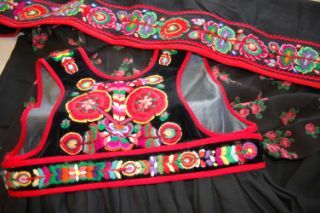 This type of apron includes an embroidered band on the lower edge, the 'forklebord'. 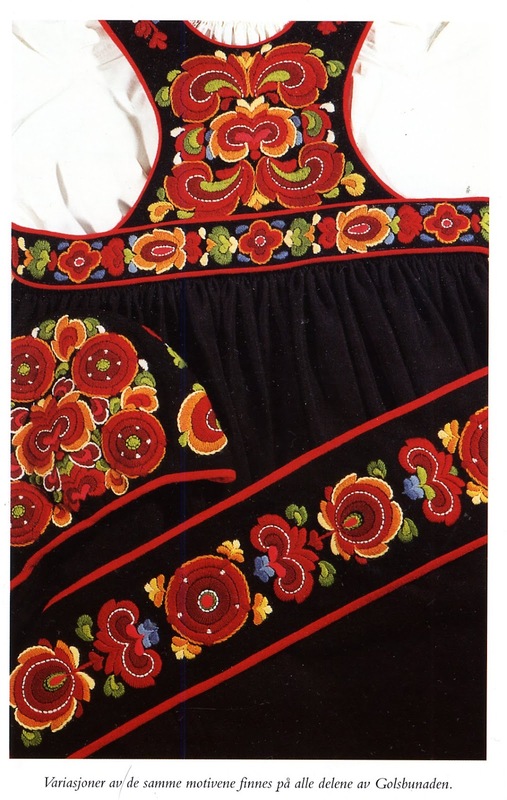 In upper Hallingdal; Hol and Ål, a plain black wool or damask apron with embroidered forklebord that matches the skirt is worn, this may be seen in the first image above. 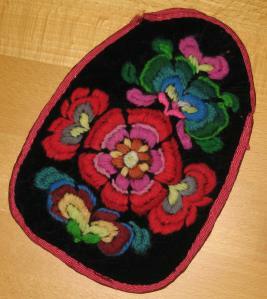 There is also embroidery on the purse, which does not hang from the belt as is usual, for obvious reasons. A very short jacket may be worn, as in some of these images above. There are silver fittings with a chain which closes the jacket, which may be worn directly on the dress if the jacket is not worn. Silver brooches with dangling 'spoons' are usually worn on the breast of the shirt. 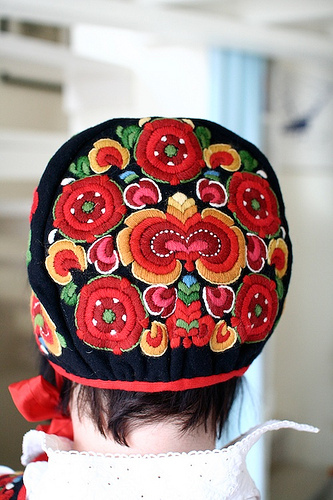 There are several possible headpieces, the most popular and simplest of which is an embroidered cap. 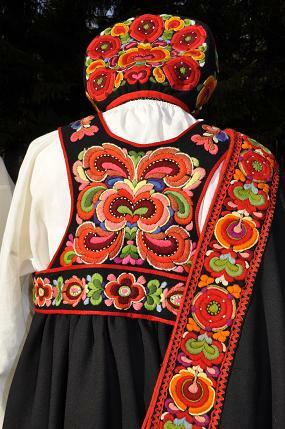 Most of Norway's folk costumes include embroidery. 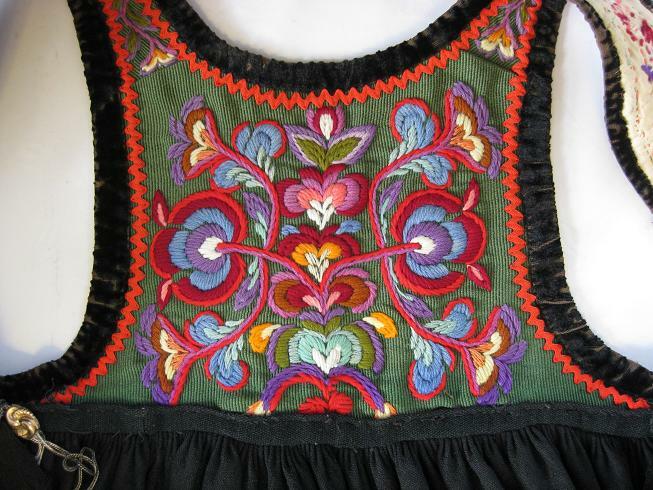 The local embroidery in Hallingdal is one of several regional styles based loosely on Rosemaling, which is a type of folk painting used to decorate chests and furniture. 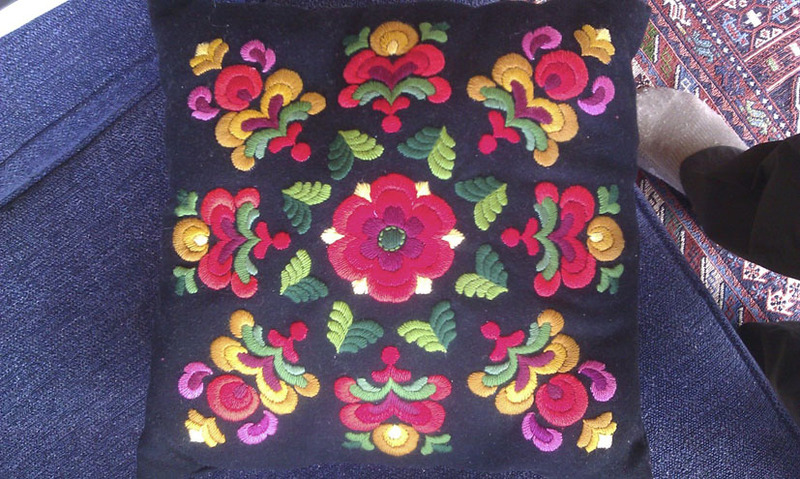 This is called Rose embroidery, Rosesom or Rosesaum in Norwegian. 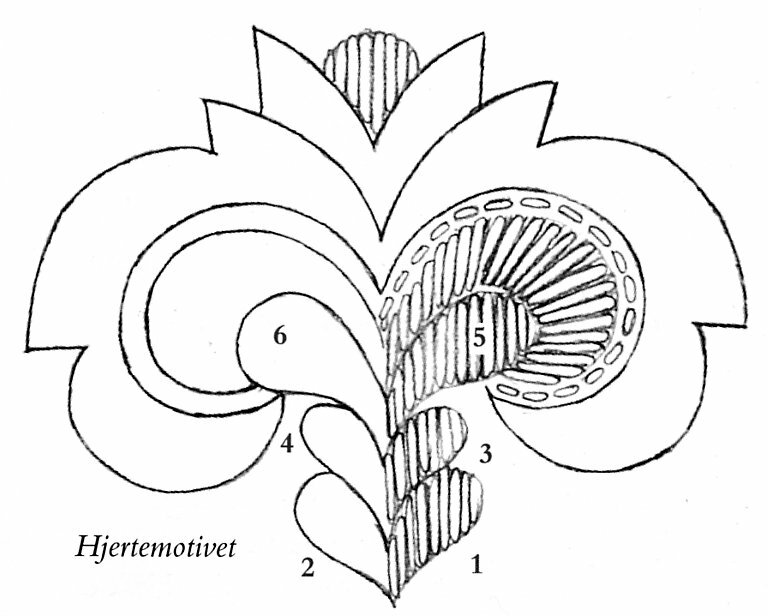 There are a limited number of motifs, which are large, consist of parallel bands of color, and have distinctive notches in their outlines. 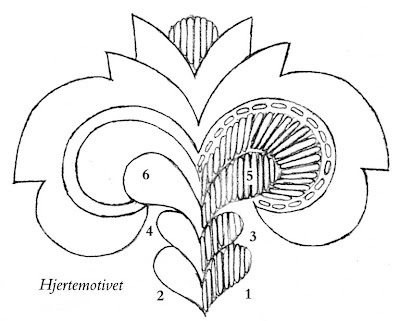 These may be arranged in different ways, and the spaces in between are filled in with teardrop shaped motifs. 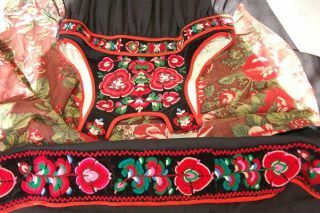 The main color, as in most folk embroidery, is red. Bright colors tend to be used, as opposed to the more muted shades of Telemark. 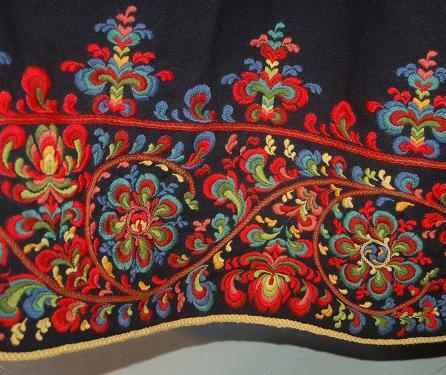 The motifs cover the ground cloth densely, and stems do not form part of the composition. 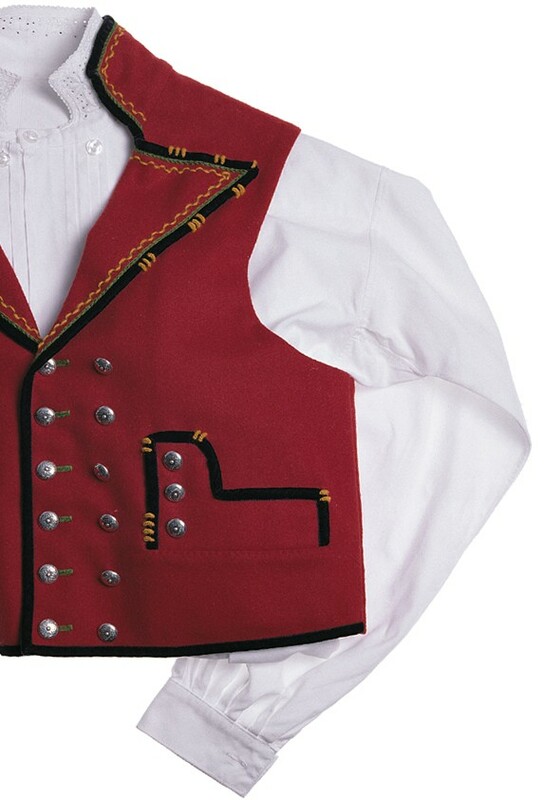 The embroidery is executed in satin stitch [plattsom], stem stitch, [kontursting], and running stitch [attersting]. 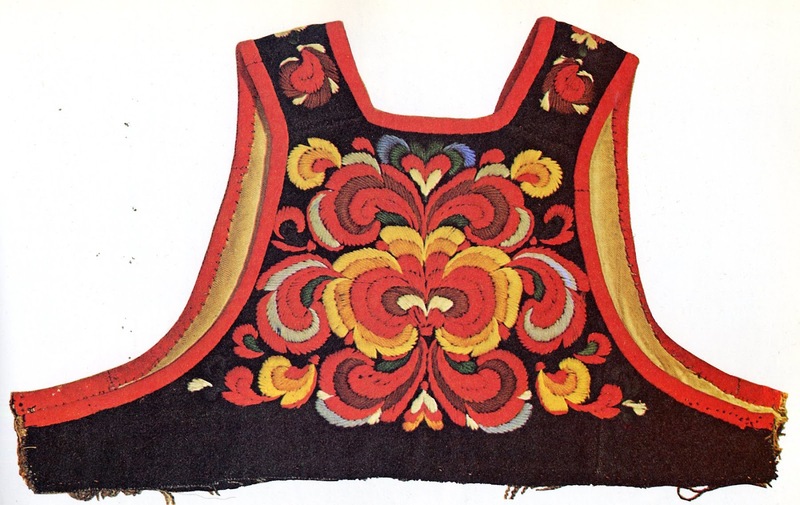 The bodice which Mary Gostelow illustrates in her book 'The Complete International Book of Embroidery', on which she bases a project and which she attributes to Telemark, is clearly from Hallingdal. This last example is from the area around Nes, which has a somewhat different style of embroidery. Here is one from Flå, also in lower Hallingdal. The costume is completed with wool stockings with patterns knitted in, and black leather shoes with buckles, such as are worn all over Norway. 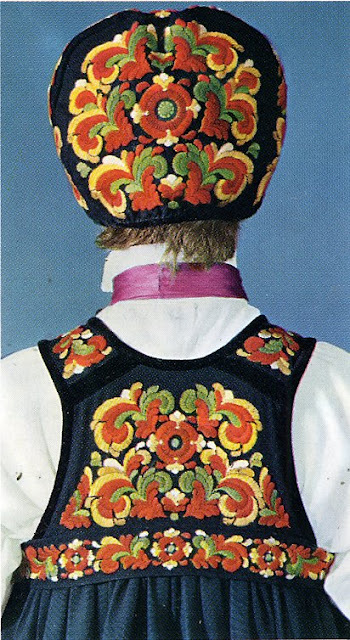 Here are two versions of the man's costume of Hallingdal, with some details of embroidery. Here are just a couple more images of this costume. In the first image, you can clearly see that her apron is damask. Thank you for reading, I hope that you have found this informative, interesting, and perhaps inspiring. 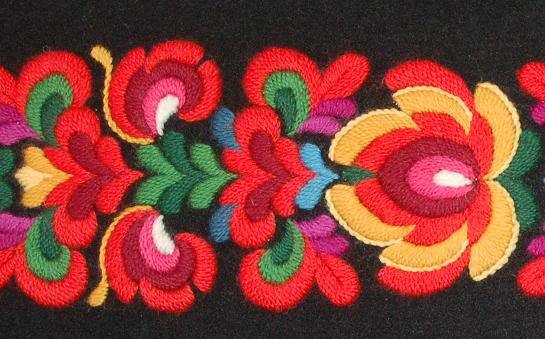 This type of embroidery would be well suited for many types of projects. Here is a video showing closeups of embroidery from Hallingdal, including some examples of the style of Lower Hallingdal, which is somewhat different. Here is a video showing a small town celebration of Norway's 'Constitution Day', May 17. This video includes closeups of this and other bunads. A couple in everyday Halling costume doing an old dance common all over Norway, the Pols. Here is a video of a couple performing a very old dance of this area on stage, the Hallingspringar. This is an improvised dance with complicated steps and rhythm. 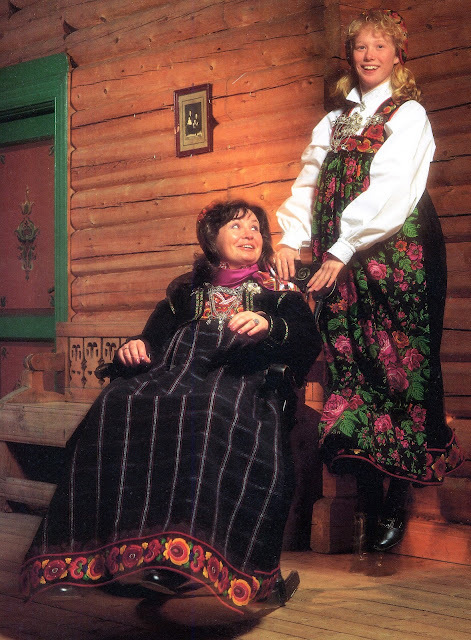 The woman is wearing the festbunad and the man is wearing the simple costume without jacket. Here is the same couple performing the same dance, in a studio. For those who are interested, the footwork is more visible. She is wearing a fancy version of the everyday costume in this one. 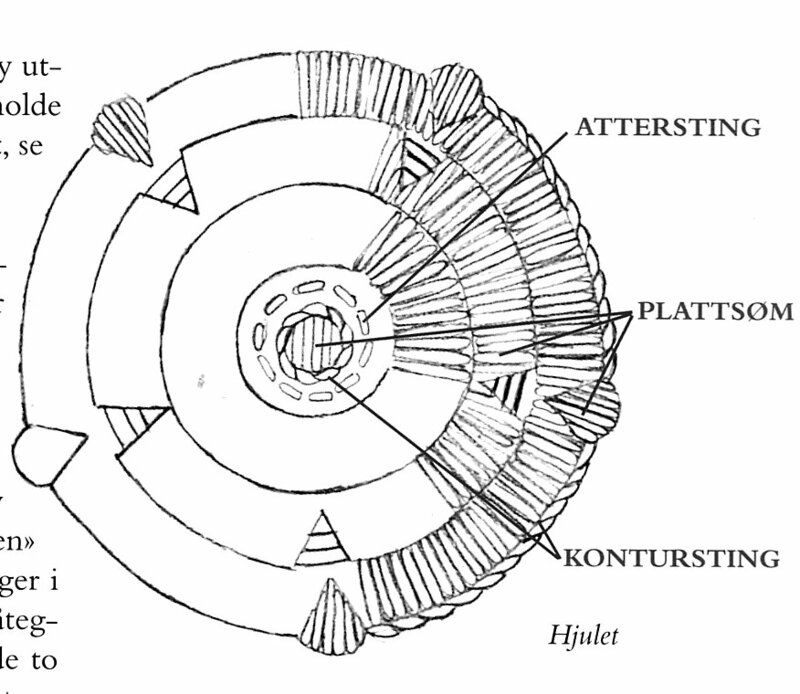 Here is the most famous dance of the area, which is called simply Halling, or Hallingdans. This is a dance for young men. The woman holding his hat is in a formal version of the Halling festbunad, note that her skirt is longer than that in the other video. Although this dance is native to this region, it has become very popular with young men throughout Norway who wish to challenge themselves. This is very worth a watch. 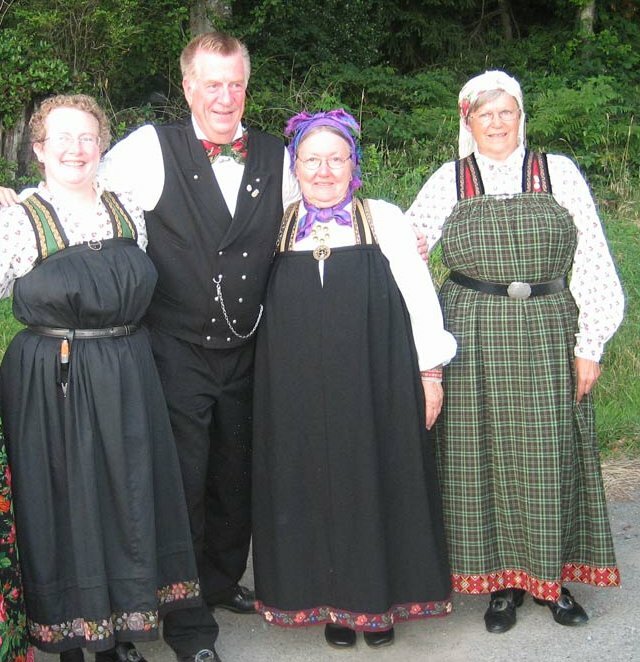 Norwegian costumes are readily available, there are numerous businesses which will gladly make one for you, or send you a kit so that you can sew them yourself. These are known generally as Husflid. Here is the website of one such company. see also links on the webpage which I referenced at the beginning of the article. They are, however, expensive, as Norwegians believe in paying people who weave by hand or embroidery professionally a living wage. What a concept! Your text "In the first image, you can clearly see that her dress is damask." is not correct. Her apron is damask, the dress is wool. 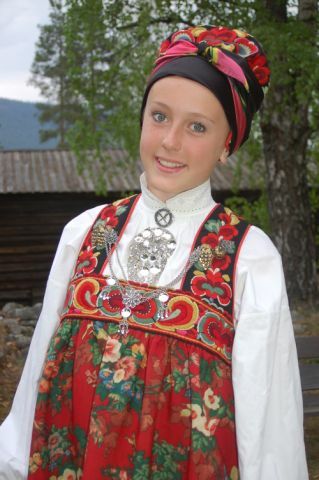 This is a bunad from Hol/Ål. 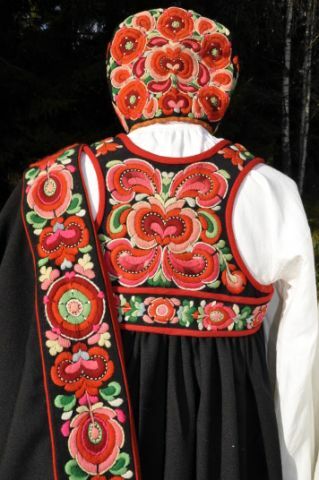 All bunads from Hallingdal has aprons, either flowers ( Gol/Hemsedal ), damask ( Ål/Hol ) or woven ( with sort of square pattern ) ( Nesbyen ). Btw: the aprons from Nes/Flå, are not just black and white. It's always black, and then some contract, for example, blue, green, purple and so on. When I started the article, I thought that she was wearing it without an apron. I learned otherwise during the process of writing it, but i forgot to alter that line. I have now done so. 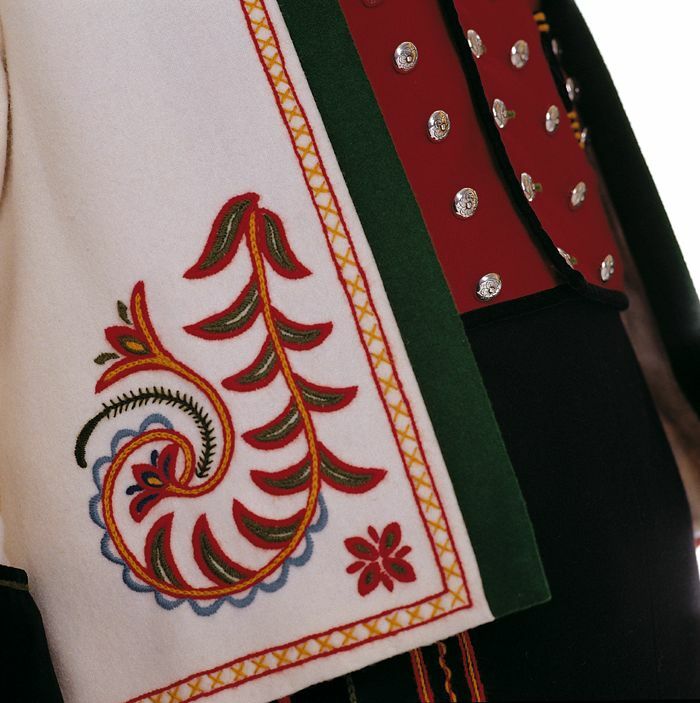 Where can I purchase wool embroidery yarn for the apron of an Aust-Agder bunad? The only place I know of is online. 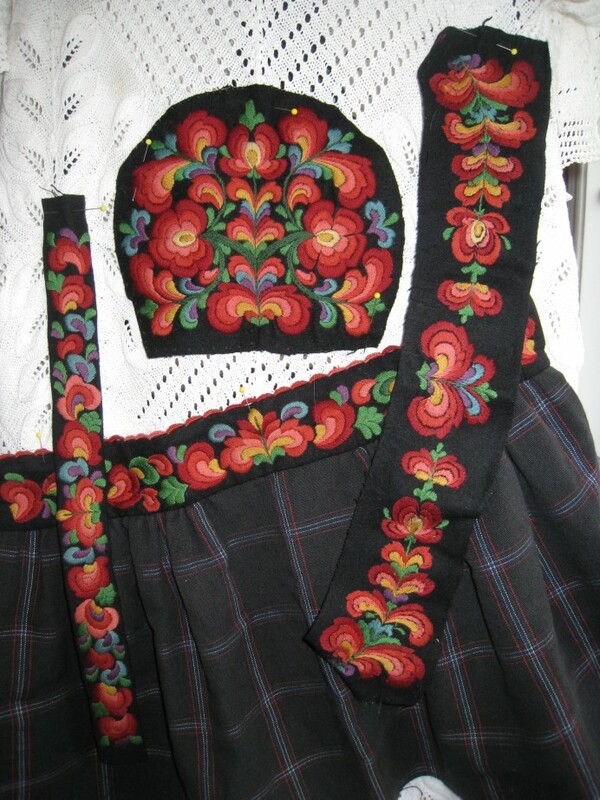 You can do an online search of Bunad or Husflid. Love the details you give. Need to find a site like this for Hurum. Thank you for the information. Is it possible to buy the finished bands of emberodery to sew onto my knitted sweaters? The skill seems so daunting, but possibly I could do it myself. I see the wool is asked about so I shall check there, too. I am going to try and make a Hol, Hallingdal bunad and want to know the ply of the yarn and the correct yarn colors used in the handwork, Also are the areas worked backed with something under the black wool to give more support to the bands and top? Any help would be wonderful.